Mokuren Dojo: How did you decide, Martin? Today we remember one of our country's foremost warriors in the cause of peace, equality, and freedom - Dr. Martin Luther King Jr. Though in his Letter From a Birmingham Jail, he states that he was a force of moderation standing between extremists on both sides, King was considered extreme by the establishment of the time, and this led to his assasination. 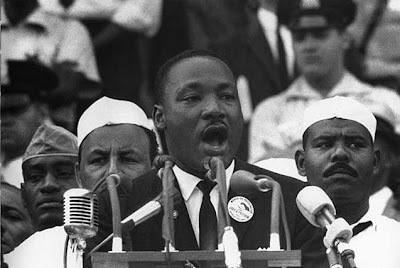 Dr. King could have possibly prolonged his life if he had skillfully shifted his position based on the forces that he encountered (aiki), perhaps going along with the prevailing forces until he could overpower them or unbalance them (ju) but instead, he effectively took a stand and spent his life all at once in the service of his cause (kime) - And it was certainly a worthy cause. But this begs the question, how do you determine whether to stand and fight right here and now or shift and live to fight another day? At what point is the evil you face so grievous that you decide to spend all of yourself right now in its downfall? Or do you simply let your enemies decide when you take your final stand? What do you think King's effect on the civil rights movement would have been like if he were alive today? If he had accomodated the establishment to any significant degree he would have sacrificed some of the moral power of his cause, but he would have had many more years to exert that lessened power. With that question as an introduction, welcome to the January 2008 edition of carnival of martial arts. This is a themed issue on peaceful warriors and conflict resolution - not that every article submitted is directly on topic, but all are interesting and worth checking out. Hilltown Families presents Peace Episode on HFVS (New Year's Day '08) posted at Hilltown Families. A little peace music to stimulate your sense of nostalgia as you peruse the carnival. Patrick Parker presents Nonviolent self defense posted at Mokuren Dojo. A curious look at a (perhaps) faulty idea of non-violent self-defense. Dave Chesser presents Aikido-like Chinese IMA posted at Formosa Neijia. A potential answer to the question in the above post. Patrick Parker presents Rolling the ball and brushing off posted at Mokuren Dojo. My own take on Dave Chesser's article above. Chris presents Conflict Resolution: A Casualty of Non-Violent Martial Arts posted at Martial Development. A valuable reminder in light of the above articles. Nathan Teodoro presents Preventing Sexual Abuse in Martial Arts posted at TDA Training. Michael Bell presents Why Study Martial Arts? posted at live-it-true.com. Dave Shevitz presents Jury Duty and Ki Tests posted at AikiThoughts. Nobody I've seen has done a better job of applying the philosophy of aiki to his everyday life than Dave Shevitz. Patrick Parker presents Creamed Asparagus posted at Mokuren Dojo. Another perspective on nonviolent self-defense - in the context of bullying. Dave Shevitz presents Martial Arts and Bullying posted at AikiThoughts. A very good answer to the above post about Creamed Asparagus. Dojo Rat presents The Significance Of Billy Jack posted at Dojo Rat. Argonautica presents Jujutsu Suffragettes posted at Argos Classic Martial Reprints . Eric Frey presents Martial Arts, Why Belt Ranking Systems Are Bad. posted at Eric Frey Dot Com. Eric Frey presents Martial Arts Training, How To See A Punch Coming A Mile Away. posted at Eric Frey Dot Com. Shaheen Lakhan presents Martial Arts Program for Children with Epilepsy posted at GNIF Brain Blogger. That's it for this month's issue. Thank all of you for participating - I hope we can keep this important discussion going. Drop by the articles you find most interesting and leave comments. Submit your blog article to the next edition of *carnival of martial arts* using our carnival submission form. Past posts and future hosts can be found on our blog carnival index page. Lastly, but certainly not least, We're always looking for blogs to host an upcoming issue of the Carnival. If you are interesting in having the Carnival appear on your blog, drop Argonautica a line at Argos Classic Martial Reprints . Alive, King was dangerous! Now that he is no longer a threat to the status quo, any politician can claim they supported his cause--thereby suggesting he would have supported theirs. The fact is that justice, freedom and equality weren't all that popular back then, and they aren't popular now either. The people say: security is important; justice can wait.